Outside of the office your employees are incredibly mobile and social and are connected to their smartphone from the moment they wake up to when they go to bed at night. They expect engaging, personalized experiences with the company they work for, but current systems are not equipped to handle these demands. Whether it be collaboration tools, the corporate intranet, or help channels, systems are disparate and disjointed and foster employee frustration and dissatisfaction. With an employee community you can arm your employees with instant access to the people, experts and data they need to get the job done from anywhere. From onboarding to payroll to file sharing, an employee community embedded in the flow of your business is the key to enabling your employees with real-time information in the palm of their hand. 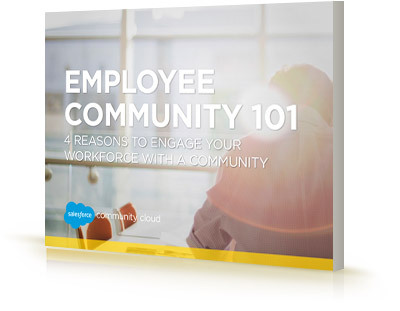 In this e-book, we explore the benefits of an employee community, best practices, and the advantage of choosing a Salesforce community. Download this free e-book today.